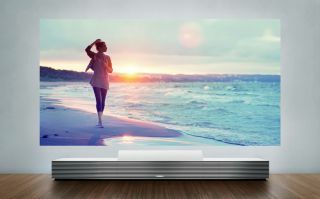 Sony’s 4K Ultra Short Throw projector is coming to the UK | What Hi-Fi? We first laid eyes on Sony’s Ultra HD Short Throw projector at CES 2014. It was initially given a US launch with a UK launch to be confirmed. Sony has now said it will arrive in Europe by summer 2015. The projector, model name LSPX-W1S, is part of Sony’s new Life Space UX entertainment concept, which aims to “transform living spaces into enriched experiential environments". It’s capable of projecting a 147-inch 4K image on to a wall from a distance of just 28 inches. For those with a slightly smaller wall space, the smallest image the projector can produce is 66 inches. The projector uses Laser Light Source to deliver a picture with "stunning brightness and colour accuracy". The projector claims to reach full brightness quicker than conventional projectors and last up to ten times longer. The projector itself has four HDMI inputs and features Sony's 4K X-Reality Pro picture technology, with support for active 3D technology too. The projector is designed to look more like a piece of furniture, with the speaker units hiding exposed cables and the cabinet being able to house other home cinema components. Thomas Issa, Sony product manager, said: "We’ve received unprecedented demand in Europe following the product's release in the United States and Japan, and we are delighted to bring this breakthrough projector to customers looking for state-of-the-art design and product innovation." A price has yet to be announced, but with it costing between $30,000 and $40,000 in the US, don't expect it to come cheap.